Donald Clark Plan B: Multitasking mahem! OMFG – they’re all multitasking (but so are we). Our kids, students and even us adults are doing it like crazy. But some of us are doing it more than others, and in very different ways. Naoimi Baron studied 158 students while messaging, and found that 98% were multitasking , with 70% web browsing, 48% other media, 39% writing a paper, 41% face-to-face conversation, 37% eating/drinking, 39% watching TV and 22% on the telephone. Always on, always connected? Not really. Multitaskers filter, block, ignore and bring activities and conversations to foreground and background. Messaging conversations range from 1 to 12, with an average 2.67 simultaneously. Interestingly, few would message while doing nothing else. This was regarded as weird. Messaging was a ‘background’ activity. OK, so we know they’re all at it, but what about the effect this has on their learning. Most studies show that multitasking impairs performance, for example with homework (Koolstra, Van der Voort 2003). Even switching between tasks impairs performance (Rubenstein, Meyer and Evans 2001). In fact multitasking itself is a bit of a myth as we largely switch between tasks, rather than doing them truly in parallel. So don't imagine that all of this social networking is helping people learn in the way we think they should be learning. On the other hand they may be learning skills that are far more useful - handling information, communication and people skills. The real advantage of all this technology is time saving, not learning. Time diaries (Keynon and Lyons 2005) have shown that people can add seven hours of activity to their day. They have shown that people can add seven hours of activity to their day. 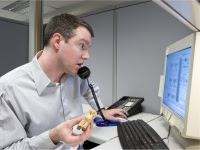 Multitasking is very common with people reporting 2 or more activities reported on 99% of days ,3 or more activities on 81% of days and 4 activities on 52% of days . Remarkably, multitasking ‘adds’ 48 hours to the average week and 46% more time to each waking day . Note that effects of multitasking are likely to be unequally distributed across society. Some of us multitask a lot more than others. So studies "have shown that people can add seven hours of activity to their day". Any evidence on the quality of that activity? Some activities are just less effective when they are mutlitasked - it's particularly difficult to listen to a conversation well when trying to do something else at the same time. Let's ensure that given the choice we do one thing well rather than two things badly. "Our kids, students and even us adults are doing it like crazy. " Shame you think kids or students don't read your blog - 'lucky them' I say! Judgemental as ever, oh lover of inductive science! Pity you're too biased to appreciate the insights of thought in science - story goes good old Einstein 'imagined' travelling on a light wave as he looked at his reflection in a mirror, and its subsequent impact. When did you last imagine? Maybe you simply waited for Einstein's theories to be proven, naturally... oh how regressed man would now be if everything was based on observed 'truth'. "In fact multitasking itself is a bit of a myth as we largely switch between tasks, rather than doing them truly in parallel." I breath and walk quite easily, plus watch TV (interactive TV naturally! ), plus listen to music as I walk, etc. It's no myth! I even recorded repeatable data on this event only yesterday, and neither stopped walking nor missed a note of Chopin's Piano Concerto no.4!!! If you want I'll post it to you for a full analysis. Fair enough - we do perform multiple tasks such as walking while listening to music. My point is that contitive tasks, sometimes regarded as multitasking, such as making a call on your mobile while driving, result in reduced performance as the brain rapidly switches back and forth from one mode to another. The Stroop Interference Test is commonly used to show this switching in action i.e. words red, green, blue are presented in different colours, then with audio. In fact, people did wait until Einstein's theories were proven empirically. Light from stars was measured bending round the sun. There is also recent empirical evidence showing that he may have been wrong. That's how science works - hypotheses are put to the test. Apples on heads and looks in morrors aside, it's the method that counts. QUOTE: "The real advantage of all this technology is time saving, not learning. Time diaries (Keynon and Lyons 2005) have shown that people can add seven hours of activity to their day. They have shown that people can add seven hours of activity to their day." This statement would not appear to be supported by the findings of a study carried out at the University of Michigan: "[the findings] quantified just how much time we can lose when we shuttle among tasks. The researchers asked test participants to write a report and check their e-mail at the same time. Those individuals who constantly jumped back and forth between the tasks took about one and a half times as long to finish as those who completed one job before turning to another." I don't understand why you don't use a name, Anonymous. Surely you must see that disagreeing with someone without revealing your identity undermines your credibility? "disagreeing with someone without revealing your identity undermines your credibility?" This is an utter moronic comment. I read the UK's excellent newspaper The Daily Telegraph and most stories are anonymous... and amazingly the paper retains credibility! QED. Go home and cry, bufoon! Maslow – who needs him! What were the Top 5 Global Brands last year?